Home » PCB Design Blog » Guard Traces: Hit or Myth? 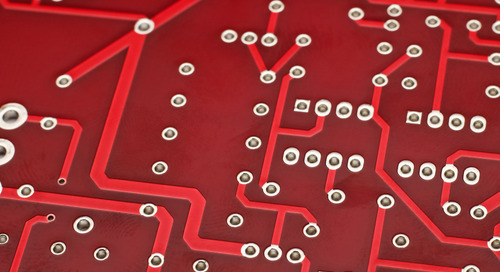 Guard traces on PCBs are another topic area where there continues to be a lot of conflicting information. You can find a lot of different references to their use. There is confusion as to which types of designs—analog, mixed-signal or digital—supposedly benefit the most from the use of guard traces; how guard traces block EM fields; the importance of having the trace ends be floating, grounded on one end or grounded on both ends and which types of traces benefit the most from the use of guard traces—microstrip or stripline. This article will address all of these topics and present data from real hardware that documents why guard traces, regardless of their implementation, provide no real value and why the height of the trace above the plane and separation of traces is the best method for controlling crosstalk. Guard traces do indeed have some value in particular product implementations specifically those that have extremely high impedance, low frequency and a very low power source. For example, in an EKG machine, which has high impedance and low frequency, there is a risk of having capacitance coupling from the outside into the trace. The signal is so low that it does not take much from the outside to upset it. In this instance, a guard trace around the signal trace can suppress the capacitive coupling. So, what about analog vs. digital designs? It’s difficult to break down the value of guard trace vs. no guard trace thinking based on whether or not a product is an analog or digital device. Defining the situation based on analog is way too general of a term. For instance, a high power audio amplifier is also Analog. The same holds true for mixed-signal designs and whether they can be classified as good “targets” for guard traces. A mixed-signal product implementation starts with an analog signal which is turned, at some point, into a digital one. This is accomplished by A to D converters and this is the usual definition of a mixed-signal product. In today’s product implementations, all radios are digital inside even the RF portions. RF circuits aren’t made any more out of L (inductive) and C (capacitive) networks. For example, in a mobile phone, there aren’t any Ls and Cs anywhere to be found. The antennas go straight into a chip that immediately turns that signal from analog to digital even in very high RF frequencies. It should also be noted that in the various sources of information regarding the use of guard traces that are currently in circulation, both near-end and far-end crosstalk are noted. In the digital world the crosstalk that is of concern is backward crosstalk. This is depicted in Figure 1. The whole idea behind guard traces is that when you put a guard trace between two transmission lines you are blocking the EM field between the two and suppressing the unwanted crosstalk occurring between them. In reality, inserting a guard trace between two transmission lines increases the space between them and it is that space increase that is reducing the crosstalk not the guard trace. If a wire could stop an EM field, a transformer would not work. What is expected is that when the energy goes past that wire, some of it is picked up along the way. We depend on that to make a transformer. The wire does not stop the magnetic field. The trace is a distributed LC network that will resonate at some frequency. If the geometry of it happens to be right, it can resonate at a frequency of interest in the design creating a band pass filter which increases crosstalk not reduces it. Figure 2 depicts such a design. This is the artwork for a failed supercomputer backplane that was built in the late 1980s. The engineers on the project were concerned that the impedance of the backplane transmission lines would overload the drivers. To prevent this from happening, the impedance of the backplane was set at 70 ohms. The designers of the backplane inserted guard traces to control unwanted crosstalk. The length of the guard traces happened to be such that they resonated at the clock frequency of the computer. The result was unwanted coupling between the signals propagating sideways across the backplane that caused the computer to be unstable. The fix was to scrap the design and start over. Never a good idea when you are trying to hit critical market windows and control overall product development costs. It should also be noted that in today’s Internet products, the PCBs are so crowded with circuits and signal traces that there is no room for guard traces. They are a physical impossibility. To What End Does a Guard Trace Control Crosstalk? There is a significant amount of information regarding the manner in which guard traces are terminated that increases their effectiveness in controlling crosstalk. The options are: floating guard traces; guard traces terminated on one end and guard traces that are terminated on both ends. In reality, regardless of how the guard traces are terminated, they are all resonant LC networks and can create a band pass filter and none of them are doing what they are alleged to do. Further, connecting both ends of a trace to a ground plane does not mean that the trace has been added to “ground” nor is it capable of blocking the EM field. Wires of any sort, no matter how their ends are connected do not block EM fields. It is the separation between traces that determines how crosstalk is controlled. Figure 3 depicts how increasing the spacing between two lines is the way to control crosstalk between those lines. Also, it is alleged that in order for a guard trace to be effective in a stripline configuration, the guard trace has to be exactly the length of the coupled length. Again, the geometrical characteristics of the guard trace have no impact on its ability to control crosstalk because it is the space between the traces that determines how well the coupling is mitigated. A number of sources indicate that the effectiveness of guard traces is different for microstrip vs. stripline topologies with the result being that guard traces are not effective for microstrip topologies but are effective for stripline ones as long as both ends of the guard trace are shorted to ground. Since the termination or lack thereof, a guard trace is irrelevant so is its effectiveness on either configuration. Understanding what works in controlling crosstalk gets back to understanding the fundamental rules of physics and how EM fields work. Classic routing has always been 5 mil lines and 5 mil spaces. You can have this spacing along with a 5-mil height above the plane. This is the configuration you would have on a four-layer PCB such as a PC motherboard. This would give you 8% crosstalk. If you didn’t want that and you inserted a guard trace, you would have to separate the transmission lines edge-to-edge by 15 mils. This cuts the crosstalk to .8%. This is a 10 to 1 reduction in crosstalk and it’s assumed it’s due to the guard trace. In actuality, it’s the space between the traces that reduced the coupling not the guard trace. Once the physics of separation is understood, it’s easy to design PCBs in such a manner that crosstalk is intrinsically controlled as part of that design process. In designing a PCB to control crosstalk, you want to make sure that the transmission line travels over a solid plane and does not have to have the DC named ground. It could be a Vdd plane. This way, the energy is between the trace and the plane. The closer the plane is to the transmission line, the better you ensure that the energy goes between the trace and the plane and not to neighboring traces. Ideally, you start your PCB stackup process by placing the trace as close as possible to the plane. Then, you pick a number that is manufacturable. In most cases it is not possible to get closer than 4 mils. Thus, you start at 4 mils and then you set the separation for crosstalk target and trace width for impedance target. How Do You Evaluate All The Data That’s Out There? There is a lot of data out in the industry that supposedly supports all the conclusions that have been made relative to the effectiveness of guard traces. But, it’s important to remember that the simulations and equations being offered are based on theory not actual results in hardware. Simulations have their value but it’s only when they are backed up with actual physical board proof that they can be deemed to be correct. Guard traces on PCBs, regardless of their implementations and terminations do not control crosstalk. In fact, because guard traces can create band-pass filters, they actually can increase crosstalk not reduce it. A good understanding of the fundamental of physics and how EM fields work is your best arsenal in reducing crosstalk. Kella Knack is Vice President of Marketing for Speeding Edge, a company engaged in training, consulting and publishing on high speed design topics such as signal integrity analysis, PCB Design ad EMI control. Previously, she served as a marketing consultant for a broad spectrum of high-tech companies ranging from start-ups to multibillion dollar corporations. She also served as editor for various electronic trade publications covering the PCB, networking and EDA market sectors.